As they say prediction is very difficult, especially about the future. At the EMRG BPO Conference in London Sheraton Park Lane Hotel on 22nd June, we had a panel discussion on the 'next generation' of HR Operating models. My thanks to the other panel experts and audience for providing the stimulating discussions. View more documents from Glass Bead Consulting. We are living with unprecedented economic change and the long-term implications for industries and economies is unclear. What is clear is that organisations need to be quick to adapt and at the same time improve productivity. A key challenge for HR leaders is providing a Human Resources Strategy aligned with Organisational Goals, however for many organisations these goals are still in a state of flux. In a recession, there are still talent management challenges, (slide 7), in attracting and retaining high performers and planning the next generation of leaders with the right skills. HR will need to allocate more resources to delivering the Talent Strategy to ensure organisations flourish in the future. The diagram on slide 11 shows a 'typical' HR function with the majority of work (60-70%) estimated to be transactional or administrative. One key objective for HR Transformation is to allocate a larger proportion of resources to 'strategic HR'. There has been an interesting debate about why HR has struggled to move from the "Pyramid" to the "Diamond". This is a complex picture, but factors include skill gaps in HR Transformation, HR technology not delivering and simply too much going on with running increasingly complex organisations. We are using a variety of social media and other tools from Twitter to Google to LinkedIn. Different groups use different tools in not so predictable ways, see article about Social Networks around the World. Tools such as Success Factors can help actively manage talent in the workforce. The emergence of Software as a Service (SaaS) and its impact on HR, (read Steve Boese's view on "Does HR need IT?") will bring more options and reduce the need for HR to make a massive up-front investment with a painful ERP business case. This will make talent management tools ubiquitous for most employees, rather than just those with more than 20,000 employees. Although technology will help us collobarate, research, communicate and network, the biggest impact on organisations will be to radically change our expectations about what we need from organisational tools. Not only do we expect tools with fast access at all times, great content and global coverage. As Web 2.0 develops into Web 3.0, there will be a demand for more semantic tools that enable us make more meaningful connections with others and become more productive. We are still in the early days of the web, it is impossible to predict the technology we will be using in 2020. To add even more value HR must understand these trends and support the workforce to become more productive. The technology we are now using every day outside the organisation is influencing the tools we use at work. HR should move towards becoming 'technology champions' as the potential benefits are huge. This entry was posted on Thursday, July 16th, 2009 at 5:58 pm	and is filed under HR Operating Models, HR Outsourcing, HR Strategy, HR Transformation. You can follow any responses to this entry through the RSS 2.0 feed. You can trackback from your own site. 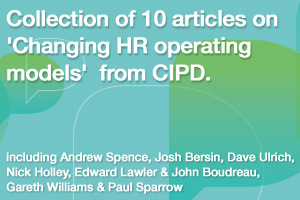 Excellent post, and thanks very much for including a mention of my post on the relationship between HR and IT. As a technology-oriented person, I may have a bit of a bias, but I absolutely agree with your recommendation that HR should move towards becoming ‘technology champions’. I love the sentiment and the phrase and I truly hope we see more and more HR practitioners taking more control of the technology initiatives in their organizations. Thanks again. Hi Steve – many thanks for your comments. I truly hope to see more and more HR practitioners taking more control of technology initiatives as this is one of the most exciting areas for transforming HR and people management. These are interesting questions raised. It’s been my observation that HR is always so busy serving, supporting and learning to lead that it often forgets to innovate. I am surprised at the Communications Management report of 80% of HR professionals using online social networking. I know many who “signed up” for LinkedIn but left it at that. I think they might be being counted.. Rah Rah to technology champions! Hi Karla – thanks for the comments. The 80% figure does seem high and probably includes those who have just ‘signed-up’ to LinkedIn and are not particularly active – but thats a good starting point. Wonderful post, I have to dig this further I believe. Sure visit this blog more often. Re: "The 80% figure does seem high and probably includes those who have just ’signed-up’ to LinkedIn and are not particularly active"
About to continue reading, will post any more interesting notes.